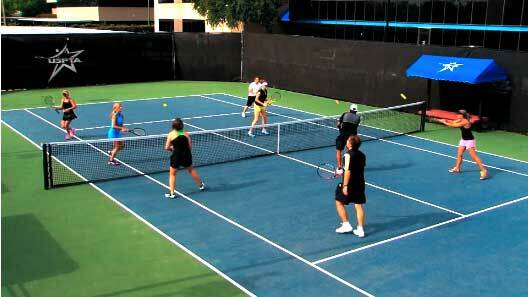 Cardio Tennis is for all fitness levels and tennis abilities. Whether you are new to tennis or play at a very high level you will get an amazing workout, make new friends, improve your play and enjoy tennis-all at once. Become a licensed Cardio Tennis Instructor. Start with the Level 1 course (7 hours) to learn the basics, progressions, the format and the time hacks. Follow it up with the Level 2 course (5 hours) which is peer teaching, working with unique numbers and Cardio Tennis +. The CTIN is for everyone….facilities, tennis and fitness instructors, anywhere in the world. If you can’t attend one of our courses, membership in the CTIN will get you started on the path to delivering Cardio Tennis classes correctly. Cardio Tennis Is The #1 Activity In Year Over Year Growth! Cardio Tennis is an excellent way to get into a more active lifestyle, meet new people, AND improve your TENNIS! In only 1 class, men can burn between 500 and 1000 calories and women can burn between 300 and 500 calories. Plus, it beats the monotony of a treadmill! Now delivered in over 30 countries, Cardio Tennis is truly international. The LTA in England and Tennis Australia are even using the program to grow participation in their countries!